The Yorkshire Evening Post has explored how campaigners claimed a ‘victory for people power’ after a U-turn by Leeds City Council (CC) over controversial plans to build thousands of homes on their leafy estate, as the Council turned its back on a development blueprint that had earmarked new housing locations that included green belt sites. 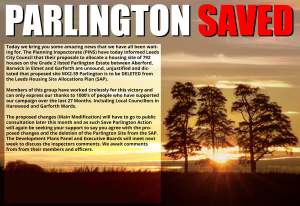 … It prompted a wave of resistance from campaigners, after almost 2,000 homes were proposed to be built in on the Parlington estate, between Aberford and Barwick-in-Elmet. However, following a two-year battle led by the Save Parlington action group, the council yesterday revealed that earmarked sites at Parlington and Stourton Grange would now ‘not be considered for development’, following advice from Government-appointed inspectors. Adrienne Sykes, chairwoman of the campaign group, said: ‘We are absolutely delighted. It’s a victory for people power. It’s not just what it means to residents in East Leeds, it’s saving the green belt and historic sites.’ The Parlington estate has areas of historical significance, including Iron Age British settlements and an 18th-century triumphal arch. The inspectors’ report came after a lengthy public consultation in 2018, which gathered more than 50,000 written comments… they said fewer green belt sites now needed to be developed, but praised the council’s ‘sound’ approach to safeguarding land, including how it aims to maximise the use of brownfield sites. … Mrs Sykes added: ‘Members of the [campaign] group have worked tirelessly for the last 27 months. At every twist and turn we thought people would tire, but we just gained more support.